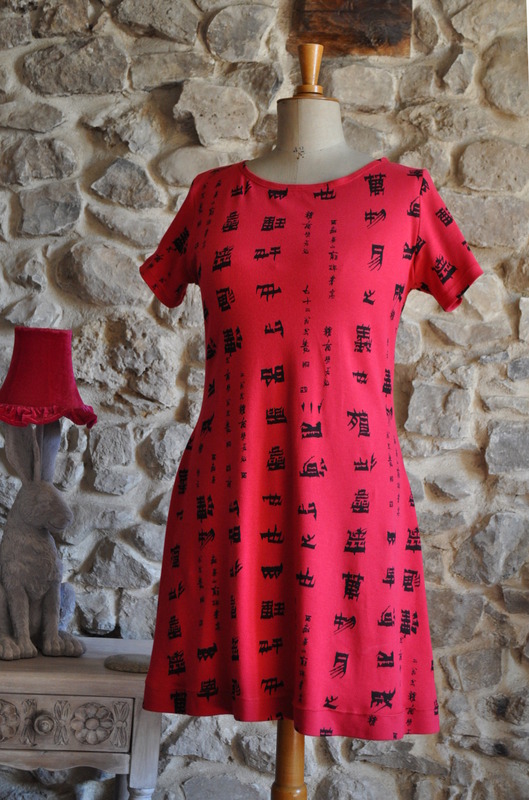 I have been very remiss with my dressmaking endeavours over the last couple of years. I have taken to knit fabrics mainly due to the fact that there is no need for buttons or zips and I can whizz through those seams with my overlocker like a dervish. I would say I have no patience but, with other projects (see above for instance), I show that I do so it’s not that. Partly, I think it’s because I have far too many clothes already and don’t need any more – although that doesn’t stop me when I’m in Zara – one of my daughters is now making her own clothes and the other isn’t overly interested in clothes per se. So, when Tilly and the Buttons released the new Rosa shirtdress pattern with a separate online workshop I thought it would be an opportunity for me to go back to basics, take it slowly and try to produce something to be proud of again. This was a leap for me as I usually try to avoid anything with buttonholes and this has 12 of them. 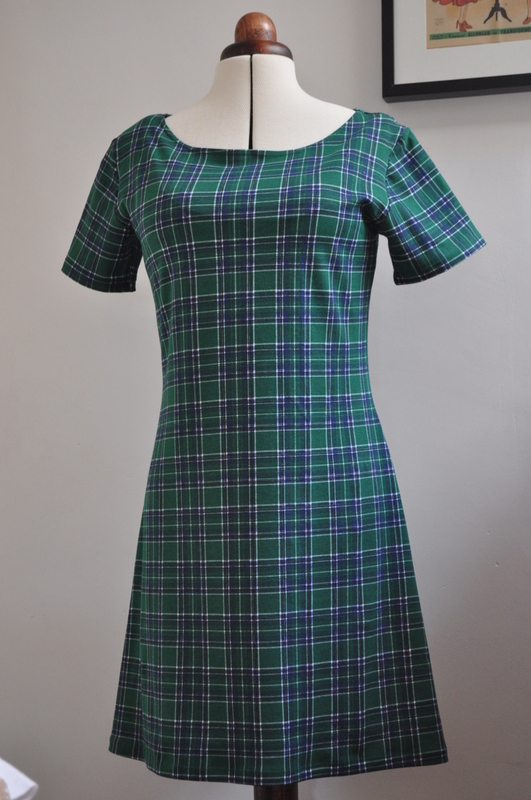 The pattern also has button stands, a separate collar stand, mock felled seams and a pointed yoke at the back – none of which I had tackled before. I figured that if I paid money for a workshop it would force me to sit still and concentrate. I originally intended to make the dress for my daughter who, at 21, already appears far too old for it judging by the lovely model on the pattern who is surely about 14 years old. Despite this, I thought it would be a versatile enough garment for both her and me. I know, from past makes with Tilly patterns that I am a size 3 or 4 – which doesn’t mean I am a 15 year old eastern European catwalk model – only that Tilly’s sizes are numbered differently. I’ve never made anything in the range for Mlle. Tialys the younger however so thought I’d first make a toile. Not being a lover of ‘wasting time’ I thought I’d make a size 4 toile in a stash fabric and we could both try it on and, like Cinderella, whoever it fit would have the handsome prince shirtdress. To save fabric, I thought I’d make the shirt rather than the dress and I used a black needlecord fabric I’d found in the local charity shop some time before. I made the toile – which fit me like the proverbial glove – and made a good job of the pointed yoke until I realised – holding it up to admire my handiwork – that you could see daylight through the fabric. On closer inspection, the needlecord had some wear and tear in certain areas and, unfortunately, it was one of those areas that I had used for the yoke construction. It had to be redone and, as so often happens, I couldn’t quite get it as good as the first time. Meanwhile, the cutting of the cord – so to speak – had resulted in a black dust that had settled over every single surface in my workroom. It was under my fingernails and on my skin – in the evening when I used a cleanser on my face, the resulting cotton pad gave me a shock until I remembered I hadn’t been toiling up chimney stacks like a female version of Bert in Mary Poppins (although more authentically cockney) but just chancing my arm with black corduroy in my workroom. So, I re-cut another toile in a cloud of black fibres and it was at this stage, laying the pattern pieces on for a second time, I forgot about ‘nap’ which has resulted in a couple of variations in the shade of black which may or may not be noticeable enough to bother me although Mr. Tialys picked me up on it straight away as men tend to do. Serging up the unfinished edges was a trial as my overlocker – a Pfaff model bought cheaply in Lidl three years ago so that I could see if I would actually use one or not – is on it’s last knockings. It chews up the edge instead of slicing through it neatly, one of the needle threads keeps coming unthreaded and little ‘nests’ of thread keep forming under the foot which all inevitably lead to the dreaded ‘overlocker re-threading nightmare’ which generally has me running screaming to the wine rack instead of just casually walking over to it as I usually do. The only good thing I have to say about the cord fabric is that there is a lot of topstitching involved with this pattern and, as I opted not to use a contrasting thread, any less than perfect stitches are neatly hidden in the pile of the fabric. 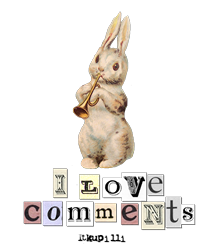 My next version will be in chambray so there’ll be no place to hide. The option of a contrasting inside collar stand and button stand makes for a nice feature which is mostly hidden but I know it’s there and it makes me feel good. Having said that, I don’t think I’ve done up a top button on any piece of clothing since I’ve been able to do buttons up by myself. I’ve half throttled my mannequin – who feels no pain – in order to prove that I can do it if I want to though. Of course, having shed its fibres in every possible nook and cranny while being constructed, the dreaded cord is now attracting every microscopic piece of fluff, thread, hair and dust and displaying it proudly to the world. Have I said ‘never again’? I didn’t take any photos as I went along – too busy concentrating and anyway I probably would have got cord dust in my camera lens. More on the pattern and a full size ‘reveal’ in Part Two. By the way, the top patchwork block was one of the three I sent to Kate for our F2F block swap and I can’t resist showing you this one which is from the Elizabeth Hartman Fancy Forest quilt pattern. Have you ever had cause to pledge never to use a certain fabric, yarn or other craft accoutrement ever again? 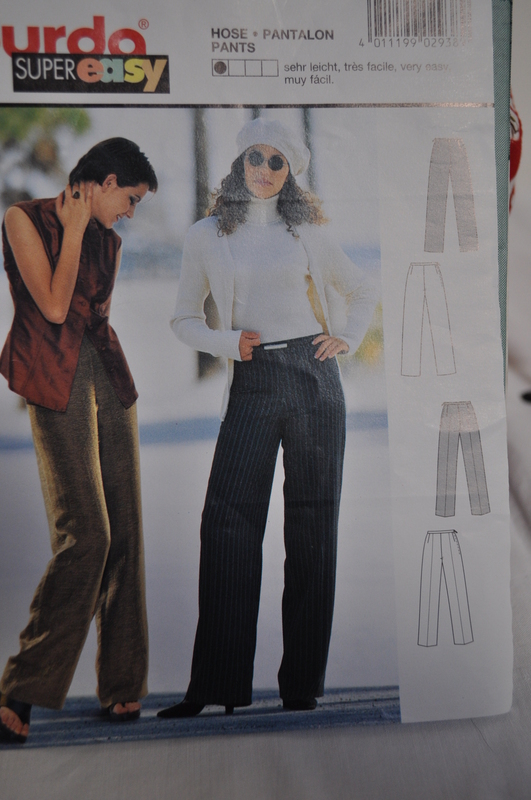 Having canvassed your advice on which pattern to use for my first pair of trousers I went for this one which around half of you went for with the others coming down quite firmly on the side of Sewaholic’s Thurlow trousers which I will do next time and already have the fabric. Why did I go for the Burda one in the end? The clue is on the top left hand corner of the pattern envelope. Never mind that the ‘sehr leicht‘ and ‘très facile‘ versions are the only ones in the packet – the ‘very easy‘ and ‘muy facil‘ versions probably having been jettisoned long ago – I don’t speak German but I do mangle the French language quite efficiently. Of course, I didn’t dare proceed without a muslin so used a sort of thin, polyester, vaguely stretchy sort of fabric that somebody once gave me a whole roll of. The town I live near in France used to have a thriving textile industry and most people around here either worked within it or have family that did so there are often various remnants of fabric bolts being offered around. Although the largest factory made (might still make, actually) the fabric for car seats which might not lend itself to many garments. This is the unironed, clipped up, clipped in front view modeled by reluctant daughter and, apart from the slight excess fabric on the front, which I think will pull up once the waistband is attached and the length taken up, I don’t think the fit is too bad. 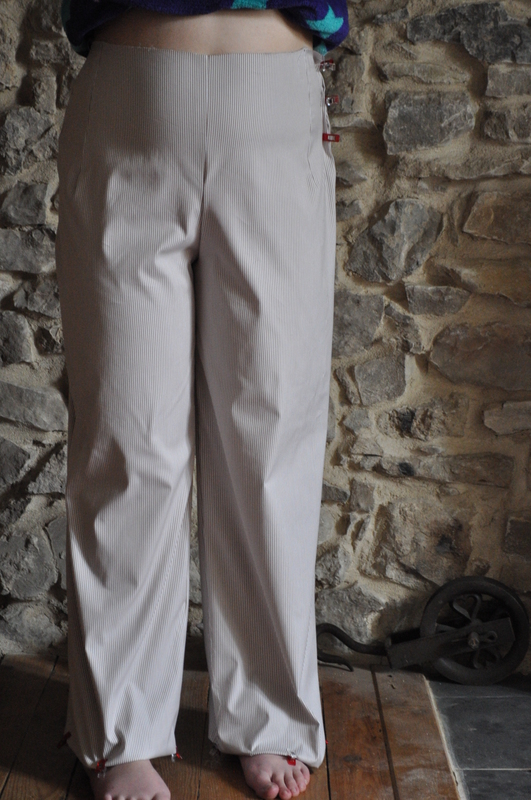 I did look at ways of adjusting the fit to get rid of the excess but it was all such a faff and I am hoping that, in the thicker, better quality fabric and with the zip put in and the waistband on, they will be fine. The back actually looks O.K. to me. and, if you ignore the unironed fabric, I don’t think the side view is too bad either. I haven’t actually made any alterations to the pattern so now I’m wondering why I thought she was not a standard size! Maybe I shouldn’t get too confident until I get to the same stage with the actual fabric. In the meantime, I ran up a pair of pull ons or pyjama pants out of yet more free fabric for casual use around the house for said daughter who, as you can see from the purple, starry top, is happiest on a Sunday when she can stay in her pyjamas all day if she wants (and she usually does want). I did use Tilly and the Buttons pattern from her book which I bought for my other daughter a while back but, instead of putting a tape or ribbon through the waist, I used elastic and then sewed the white cord on for decoration and to carry on the marine theme that seems to be going on in the fabric. I was very proud of my stripe matching on these and can assure you that my model is standing on the wonk and it’s not the pants. Honest! I know I’m a bit addicted to making this dress but I have loads of stretch fabrics in my stash and it only takes a mo. Also, this one is for my youngest, not me, and as she refuses to model and it doesn’t fit me I had a good excuse to use the mannequin. I have decided that I’m not totally happy with the way the neck is just turned over on this pattern because it does seem to stretch out a bit as you work on it so, if I make any more in future, I think I’m going to make a neckband as in the Lady Skater dress. This one does actually lay flatter on the neck when it is on a real life person but the mannequin is a little under-endowed in the bosom department so she’s not filling it out adequately. Honest! I hope you are suitably impressed that I have tackled the tartan again. I made absolutely no attempt to match it this time because I am a stingy, penny pincher who only wanted to buy one metre and was determined to get the dress out of it come what may and I had to do all sorts of tricksy layouts and cutting to achieve it. So, all things considered, I don’t think it looks too out of whack. 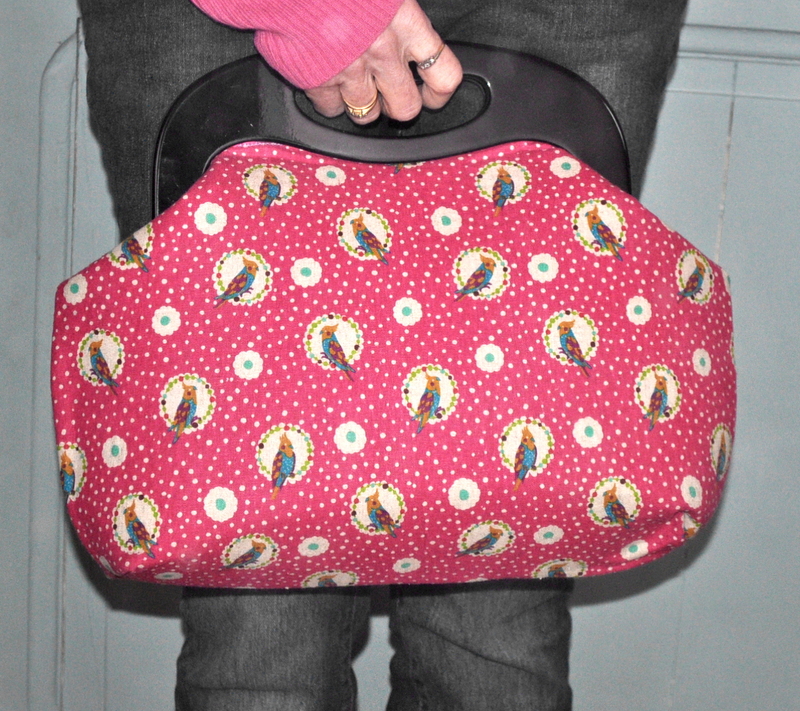 Anyway, I must get back to more challenging things with zips and buttons – I feel a bit lazy and my overlocker and I have become inseparable (until it becomes unthreaded and then we have to have words – and they’re not polite ones). By way of a change I thought I’d make another couple of sewing boxes as my last one was recently packaged up and sent off to the States. I’ve started to make two at once because some of the steps involved need a few hours drying time before I can continue and it seems to make sense. Also, I only make them occasionally and when the mood takes me so at least I end up with two to tide me over until the next time I get sewing box withdrawal symptoms – an actual psychological condition I believe. 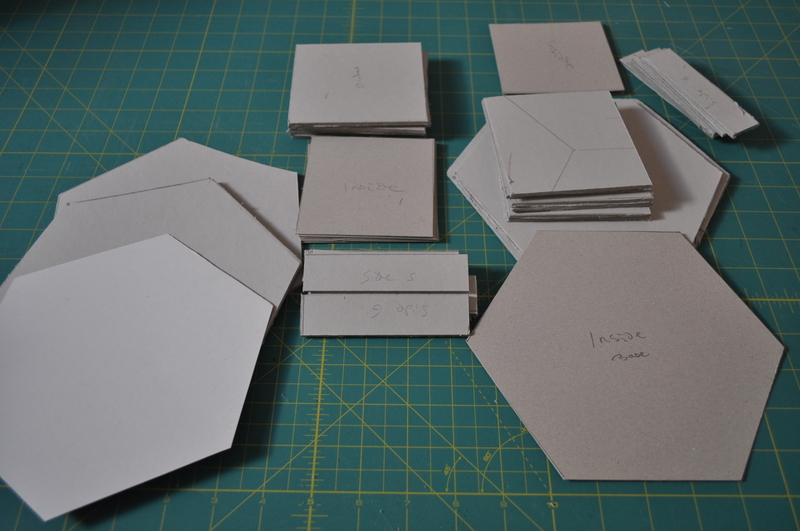 I have been cutting out the card shapes today. When I bought the kit for this a squillion years ago, it came with pre-cut card shapes which was a luxury. Now I have to cut my own and it is a bit of a pain. At the moment I have some 3mm card for the exterior which makes for a very good, strong box but I feel I need some sort of power tool to get through it. I used a Stanley knife in the end as my rotary cutter gave up the ghost and had to be passed over each line about ten times before even making an impression. These are the pieces for two boxes. The same will have to be cut in fabrics and wadding but I shouldn’t need the Stanley knife for that. 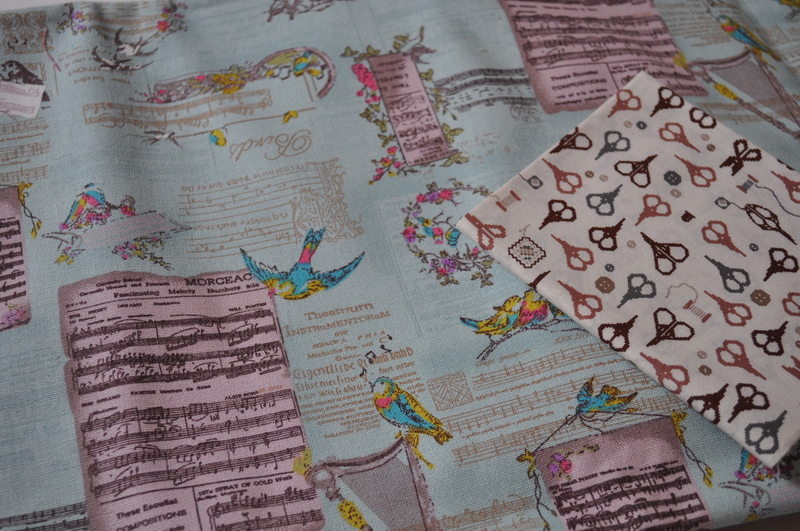 I’ve chosen the fabric – unless I change my mind again before the cutting stage – and this one will be good for those who like a cup of tea with their sewing. 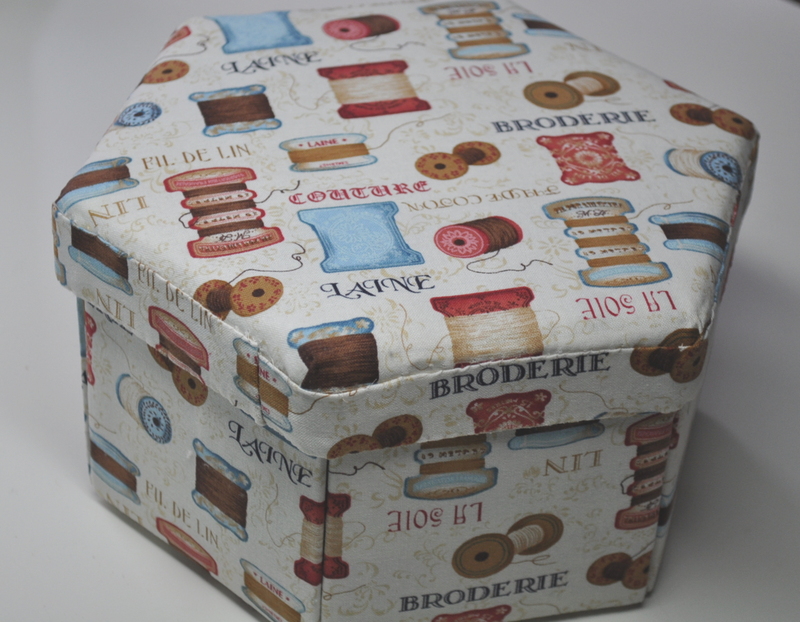 Hopefully I have enough left of the little buttons fabric for the interior as I used it for my last box so I might have to swap that one for something different. 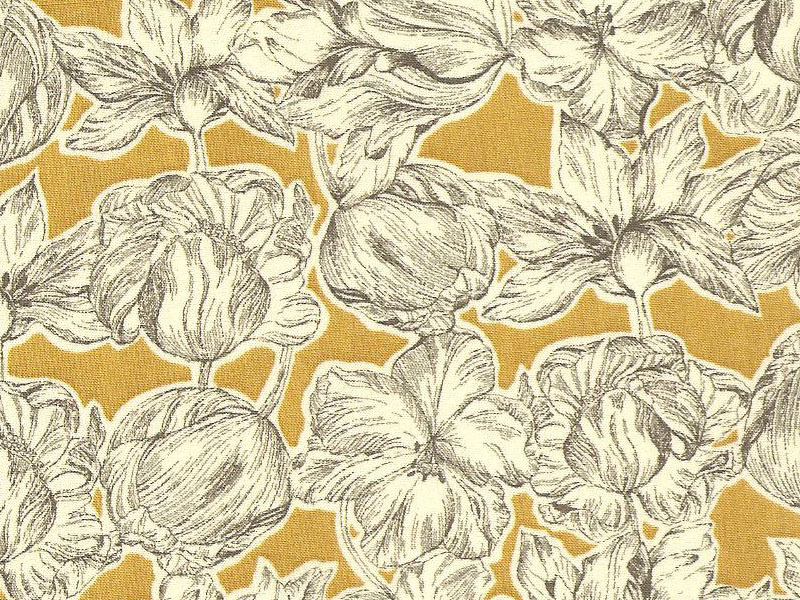 This one is a linen blend fabric which I actually bought to make a lampshade and then changed my mind. The little scissor fabric will make a nice interior I think. Actually, now that I’m looking at the photos, I think I might swap the interiors round and have the scissors with the teacups and the buttons with the birds and music. In somewhat of a coincidence, seeing as my last post was about dogs and teeth, my most recent finished garment that I have got around to photographing, is in a dogtooth check. You couldn’t make it up. This is another short sleeved Coco dress which I made from a metre of 3.99 jersey I found on Ebay and so the fact that it’s not my favourite of all time, bothers me not at all because it took me a couple of hours from start to finish and, at that price, I can wear it to flit about the house in and be comfy. 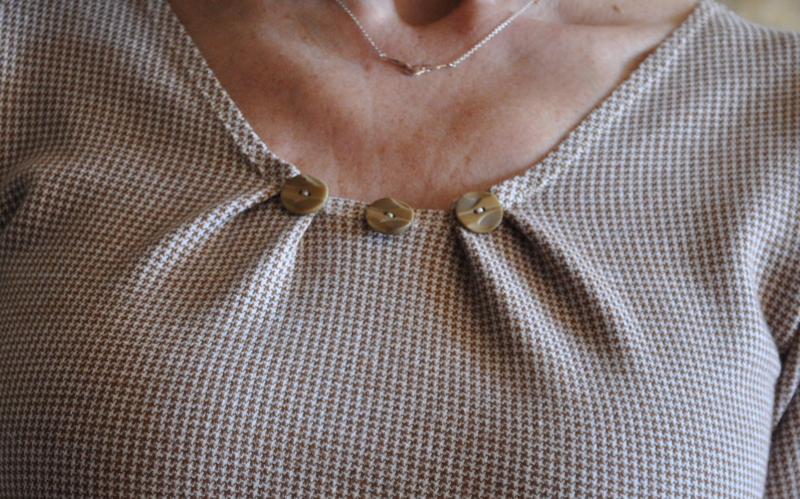 There are several reasons it’s not my favourite and one clue is in the above photo where I have hacked the style of the neckline – which should be flat – because, once again, I overestimated my size and made it too big. Then I had to do all sorts of taking ins and faffing abouts to get it to fit me and I ended up changing the shape somewhat. I call them ‘design features’ though others might call them ‘mistakes’. Also, I think the dogtooth check is one of those fabrics that, from a distance, will just look dull and boring and ‘beige’. Maybe it calls for a belt? I have cut myself off at the knees as they are not yet tanned and, in fact, looked bluish in this photo so I have spared you the sight. 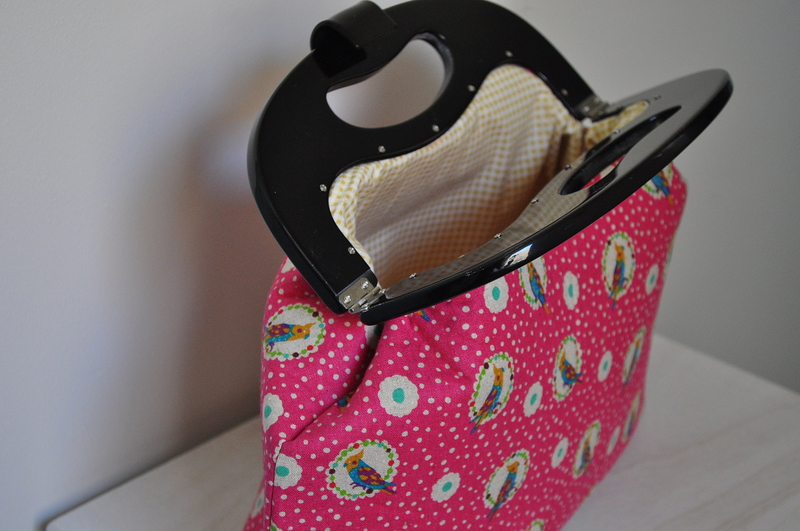 So, leaving dogs, teeth and doggy dodgy checks behind, I decided make a bag in a bright and cheerful linen mix fabric. 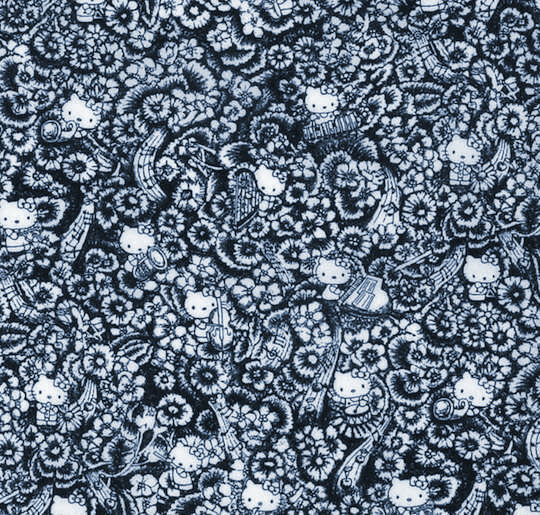 This is a pattern I bought from UHandbags and it does indeed look quite professional as she promised it would. 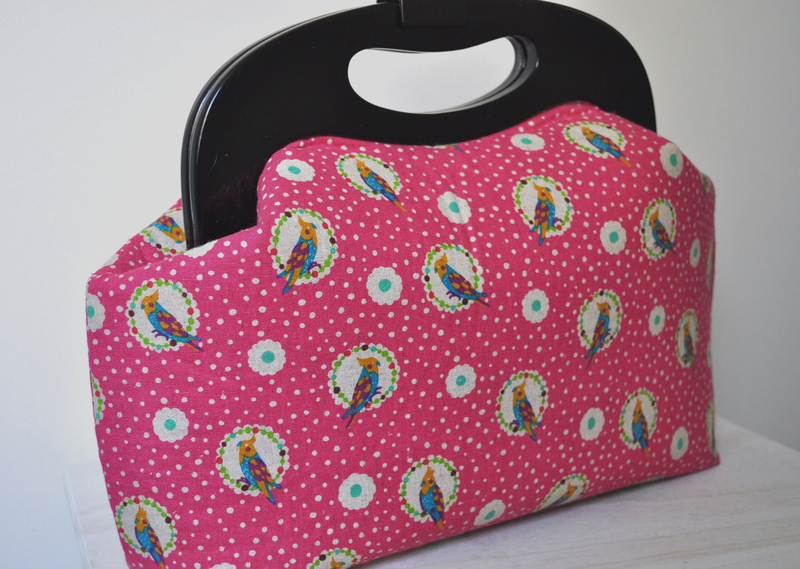 The resin handles have something to do with that as well as the super duper foam fusible interfacing she suggests (and sells) which makes the bag firm but still satisfyingly squidgy at the same time. The tiny seam allowance – 0.5cm – worries me a little but I guess that is to minimise bulky seams as there are two layers of fabric a layer of medium weight interlining and a layer of the foam too. So you just have go be careful there. Also, the thicker the ‘sandwich’ when you poke it into the frame, the better, as it gives those tiny screws something to bite into. I actually used a linen blend for the exterior and a quilting cotton for the interior and I did have to beef up the edges a bit to get them to stay in the frame. Next time I will use thicker fabric for the exterior and use something like the linen blend for the interior (as was actually suggested in the pattern) and I think this will make it all more manageable and easier to achieve the best possible finish. It’s a good size bag although, I must admit, the frame doesn’t open quite as wide as I had hoped but then I do like to have a good old rummage around in my handbag which means I like to get practically my whole arm in. This is not necessarily a good thing as all sorts of stuff ends up in the furthest corners of my handbags never to be found again so this might force me to be a little neater. I am going to send this over to the U.K. for Mlle. Tialys the elder to take to work for a week and let’s see how it holds up on the London Underground, the tram, holding her lunch and generally being ‘used’ for a week or two. If it passes the endurance test, I’ll be making more because I really love the way it looks. I am getting to the state where I have so many projects in mind that I can’t remember what yarn or fabric I bought for which project. 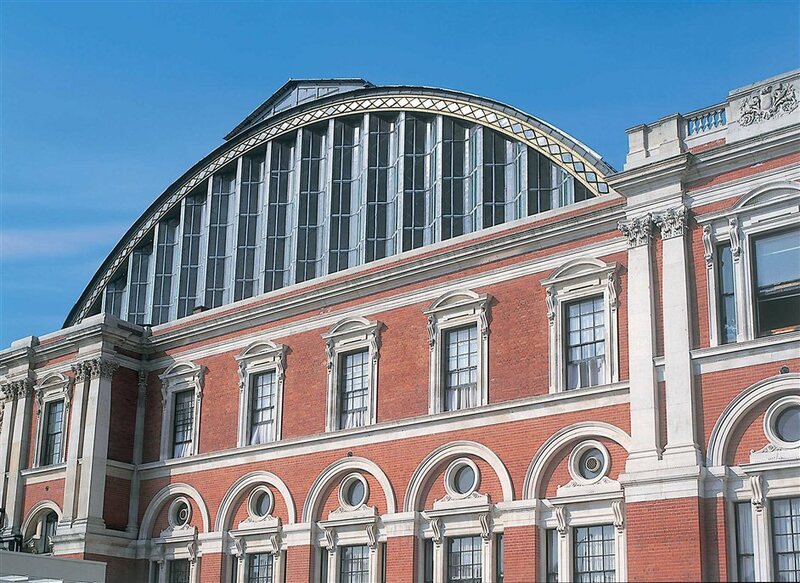 Partly, that is due to a bit of a spend up at the Knitting & Stitching Show at Olympia a week or so ago where I was as tempted by the stands selling wool as by those selling fabric and divided myself, and my money, between the two – well, it was only fair. I found the Olympia venue much more manageable than the Alexandra Palace show I went to in October last year which was almost too huge and overwhelming and, as a result, I didn’t spend quite so much there as I did here. Anyway, I sort of had projects in mind for fabrics as I want to make another Coco dress not for my daughter this time, but for me. Having already made one in a finer jersey, I chose a double knit jersey this time in a shade of blue I have heard referred to as ‘airforce blue’ – so it is sort of bluey, grey – which I found at the expo for £7.99 a metre which I didn’t think was bad. At the risk of looking like one of the crew on the bridge of the Star Ship Enterprise, I am doing the funnel neck version with 3/4 length sleeves and I need to hurry up because, when the sun comes out here now, it’s quite hot so I won’t have long to wear it. I would have finished it by now but my Mum came back from the U.K. with me for a week and I went on a knitting fest with her as it is more sociable than disappearing to the sewing room – although I did manage a couple of trips up there when she dozed off watching her soaps. On the same stand where I found the double knit jersey they were selling loads of lovely Liberty tana lawn for £14 per metre and I haven’t seen so many different designs available in one place for ages so I had to indulge. 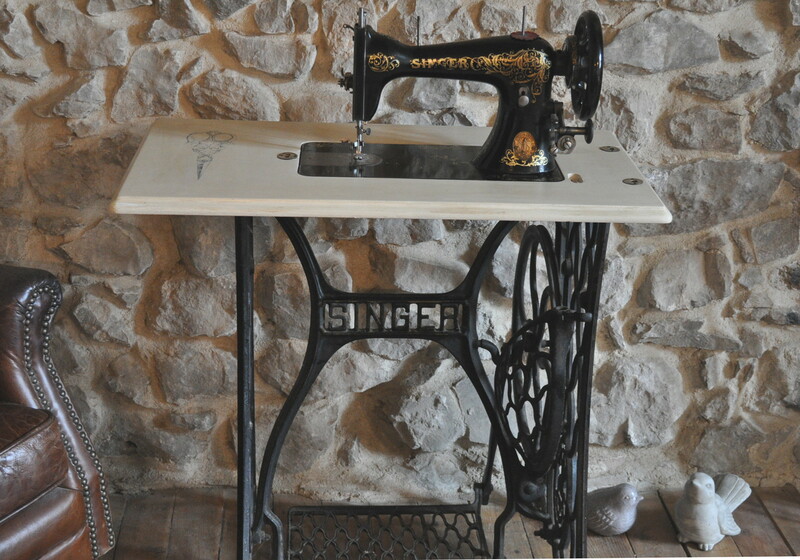 I’ve had an antique Singer sewing machine for a while now and keep meaning to do something with it in terms of renovating it a bit and perhaps actually using it. Mr. Tialys had taken it all to pieces for me and I had the sewing machine on a shelf in my workroom but I kept brushing past the stand in the shed on my way out to the garden and decided to do something with it. The wooden table part was a bit yukky so I thought I’d give it a couple of coats of chalk paint and decorate it with an image of a pair of antique scissors. I might do a bit more distressing but this is as far as I’ve got at the moment. A lot of the decals on the machine are worn but I don’t think my fine painting skills are up to restoring those. After a bit of research, I discovered this machine was made in Scotland in 1906. The belt is missing from the treadle mechanism so I will have to search for a replacement online but, apart from that, I think it should work O.K. There is also a large wooden cover for the machine – you can see the fittings for it on the top – and also a drawer – but I can’t decide whether to leave those in the original wood or paint them to match the top. I don’t normally like painting over lovely wood but this isn’t that great quality so I will give it some thought. After a bit of research, I discovered this machine was made in Scotland in 1906. The belt is missing from the treadle mechanism so I will have to search for a replacement online but, apart from that, I think it should work O.K. There is also a large wooden cover for the machine – you can see the fittings for it on the top – and also a drawer – but I can’t decide whether to leave those in the original wood or paint them to match the stand. I don’t normally like painting over lovely wood but this isn’t that great quality so I will give it some thought. The ‘spooky’ thing was that, after I had had a little play with this yesterday, I looked in the T.V. Listings mag I get Mr. T. to bring over from the U.K. with him, and noticed that tonight’s Great British Sewing Bee episode will feature some of these vintage machines. Apparently the contestants will be presented with a 1930s pattern and they will be making a coat. I’ve never made a coat – let alone from a vintage pattern – so it will be really interesting to see what they do although I don’t think they will be cruel enough to make them sew the coat on a treadle machine. Will they? 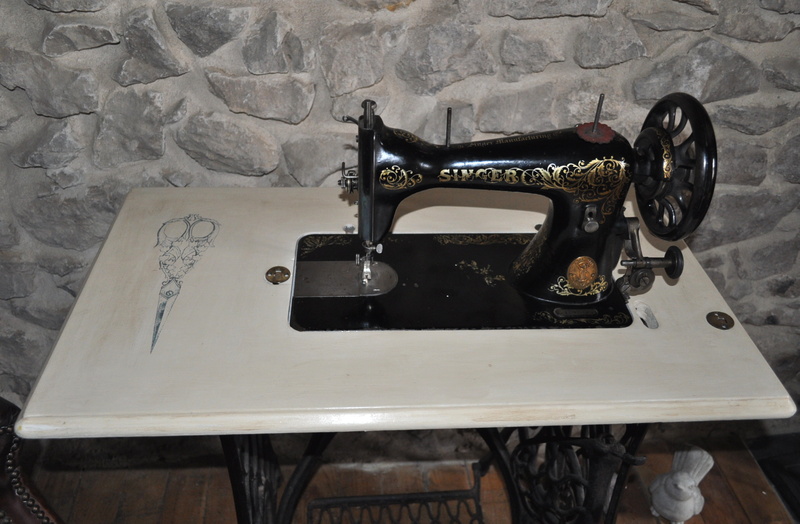 Have you got an antique or vintage sewing machine? Do you use it or is it décor only? If you use it, what do you use it for? Just asking as I’m interested. Anyway, this pattern from Tilly and the Buttons is a nice, easy pattern which goes together quickly especially, but not necessarily if you have an overlocker ( preferably threaded!). Also, a nice, easy style to wear with a couple of variations such as a funnel neck which I might do for myself. You can also make a tunic length top with the slash neck or funnel neck and either long or 3/4 length sleeves. 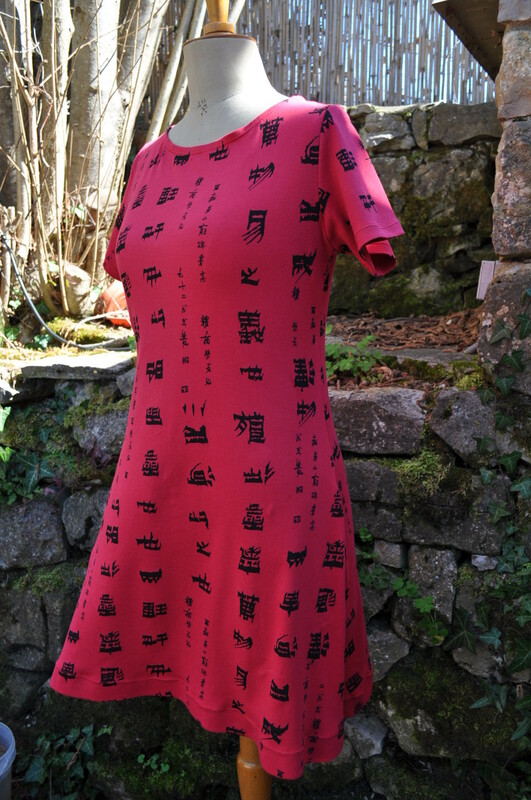 I made this Japanese themed version for my daughter who is mad on all things from Japan (but especially manga) and I apologise for the mannequin rather than a live model but she is shy and I’m not sure Kanji symbols would do much for me. I took the mannequin outside to take the air and for a bit of March sunshine – nobody can say I’m not good to my staff. 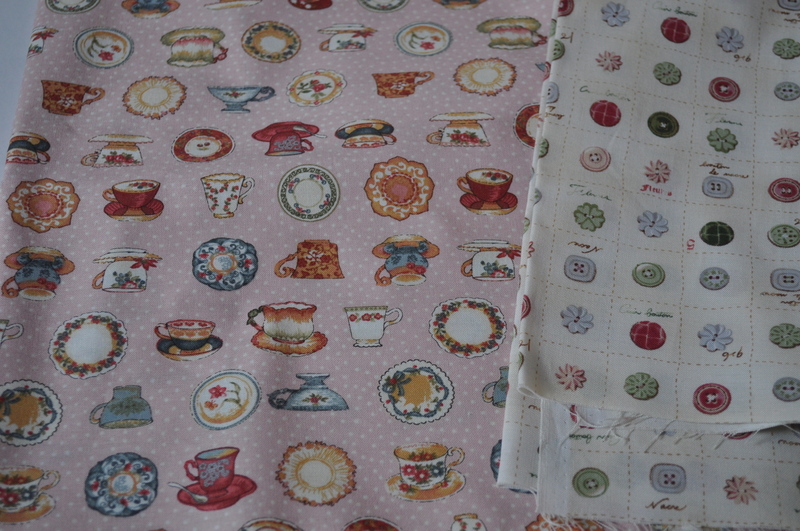 I notice the sunshine made the fabric look a bit more pinky than it really is – top picture is more accurate. I’m going to order some slightly less stretchy knit for my one and make it with the funnel neck and 3/4 length sleeves and, as I’ve tried the Japanese one on (even though no photographic evidence exists), I know exactly what size to cut for myself.